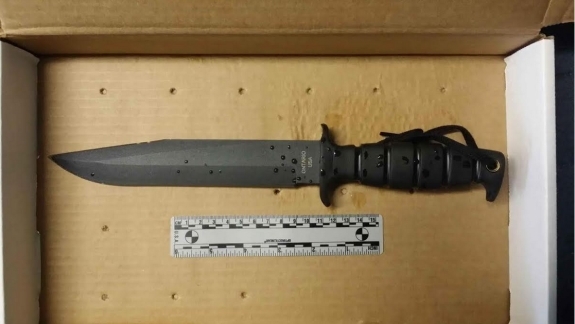 One of the knives: Source: Boston Police Department. At 5 a.m. yesterday — two hours before he died in the Boston neighborhood of Roslindale — Usaamah Abdullah Rahim called David Wright of the Boston-area community of Everett, according to an FBI affidavit from a member of Boston’s Joint Terrorism Task Force. Wright, 25, also is known as Dawud Sharif Wright and Dawud Sharif Abdul Khaliq, the office of U.S. Attorney Carmen M. Ortiz of the District of Massachusetts said. Here we’ll point out that, just a little more than two years ago, President Obama spoke at an interfaith service in Boston in the aftermath of the terrorist attack at the Boston Marathon. Obama noted that “doctors and nurses, police and firefighters and EMTs and Guardsmen” ran toward the explosions to treat the wounded. A little more than a year ago, while feting the Boston Red Sox at the White House for winning the 2013 World Series, Obama reminded the audience once again of the valor on display by police during the Marathon bombing. He noted that Officer Richard Donahue of the MBTA Transit Police was shot and nearly killed in a battle with the terrorists and was fighting back from his injuries. MBTA police noted that their colleague, Officer Sean Collier of the MIT Police Department, was killed by the terrorists. Despite the Marathon attacks against innocent human beings — and despite the fact the police are the thin blue line that protects society — Rahim apparently wanted to kill Boston-area cops. And Wright, according to the FBI affidavit, apparently had so little regard for the lives of police officers that he instructed Rahim to wipe his smartphone and computer to make sure the plan was not detected. There are reports that Rahim worked at the store as a security guard. As alleged in the complaint affidavit, Rahim, a 26-year-old private security officer, was planning to engage in a violent attack in the United States, and had purchased three military-style fighting knives and a sharpener in furtherance of this plan. In intercepted calls between Wright and Rahim, the men discussed a knife attack on an individual not named in the complaint, and suggested that the target was to be beheaded and have his/her head placed on his/her chest. According to the complaint, such beheadings are a tactic of some foreign terrorist organizations which use such killings in propaganda videos. The implication, of course, is that Rahim had been inspired by ISIS and/or the beheadings carried out by the terrorist group. America and other nations have been on guard for such gruesome aggression — and police are the first line of defense. Before shifting focus to police, Rahim had talked about “beheading” a person in another state. CNN is reporting tonight that the planned victim was conservative Blogger Pamela Geller. The probe also extends into Rhode Island, according to the FBI affidavit. That’s allegedly because Rahim met with Wright and an unidentified third person on a beach during “inclement weather.” The date of the meeting was May 31, just days after Rahim had acquired three knives on Amazon.com and a device to sharpen them. A second Marine fighting knife. Also see Washington Post report.